As our group moved into the mountains of South Island, fall colors were evident. 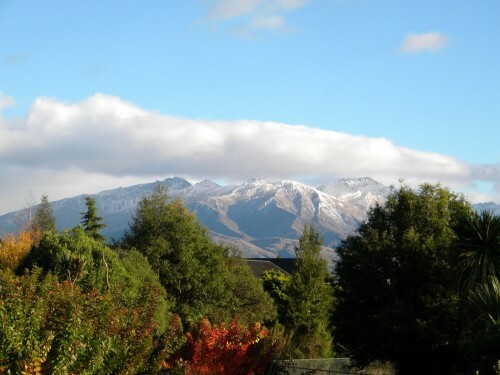 At Wanaka, we experienced the first snowfall of the year. 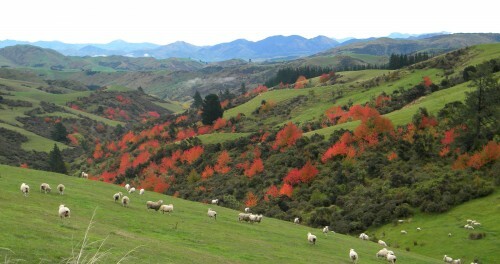 Crossing over the pass to Westland, colors were stunning. 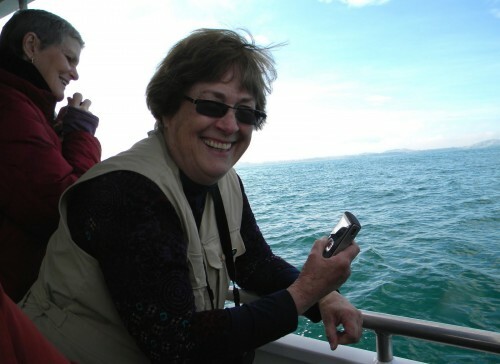 But, the primary reason that I wanted to be in Kaikoura was to go out on a pelagic birding trip with Albatross Encounters. 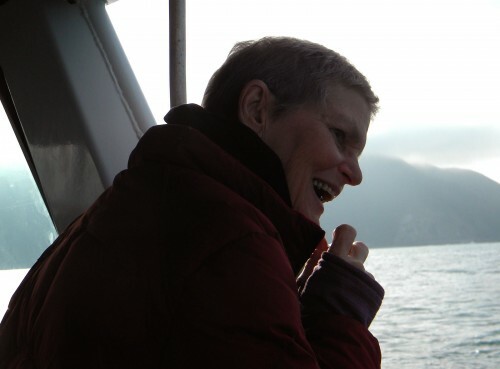 It is, without a doubt, the best pelagic in the world, if the weather cooperates. This was my third trip with Captain Gary and it was every bit as wonderful as I had hoped. 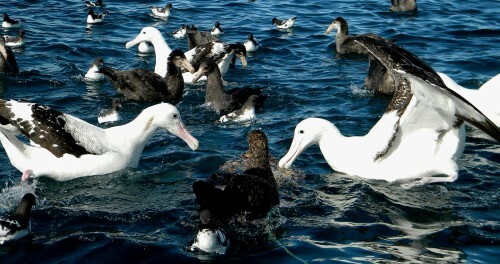 The continental shelf drops abruptly to the ocean floor about 2 miles offshore here, creating a nutrient rich upwelling of water and huge numbers of oceanic species, like Royal, Shy, and Wandering Albatross, as well as Giant Petrels, Cape Pigeons, Gannets, and more. The birds are so close that you could almost reach out and touch them, although doing so would definitely risk the loss of digits. We were 9 strong on this outing, more than half of the tour participants came out with me. Betty loved the close-up views of the birds. 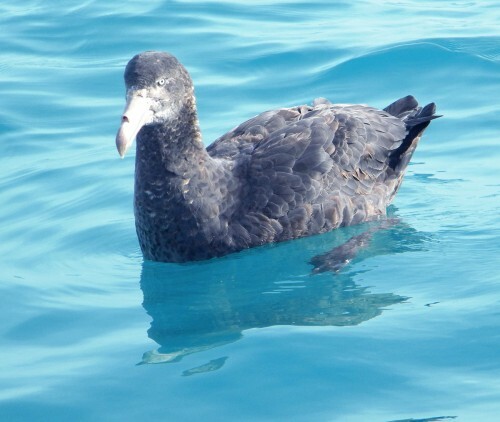 This Southern Giant Petrel, below, posed for the camera while waiting for a turn at the chum basket. I think our group must have taken hundreds of photos. Notice the calmness of the ocean on this day. 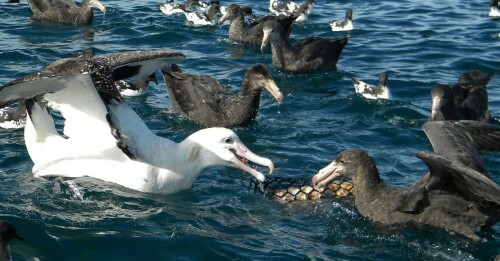 Our captain told us that this Northern Royal Albatross was a very old bird, possibly 50 years old. 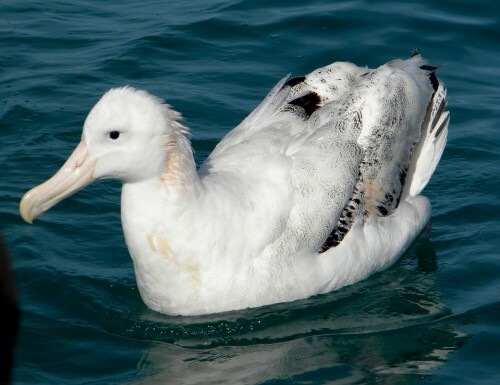 Apparently, albatross plumage becomes paler with age. The peach coloring is a remnant of breeding plumage. Upon our return to shore, we were greeted by this shag and gulls. 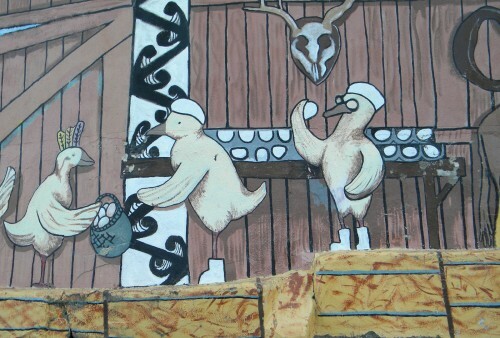 A wonderful trip, not to be missed if you are in New Zealand. 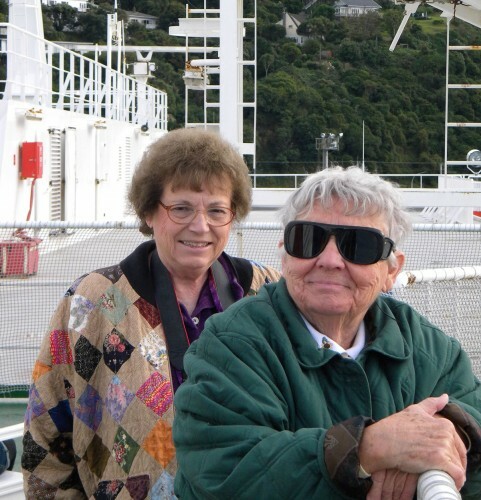 Dave and Betty enjoyed the brilliant sunshine on this warm day as our snacks were set up outdoors. Quite a charming little shop. Blenheim, locating in the heart of wine country, is a working town, with a path along the river. 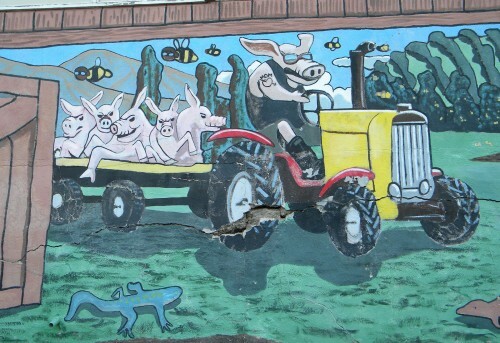 Imagine my surprise when, during a solo evening walk, I came upon this delightful mural that stretched for a good distance. 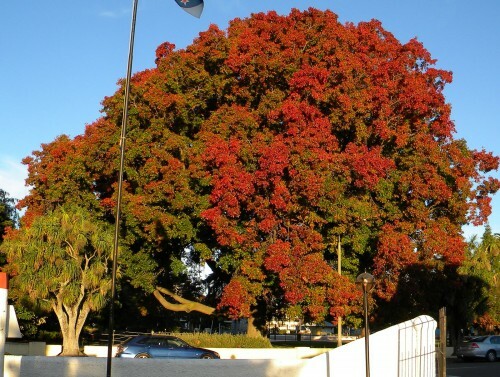 Fall was definitely in the air! And, sunrise the next morning was positively brilliant. 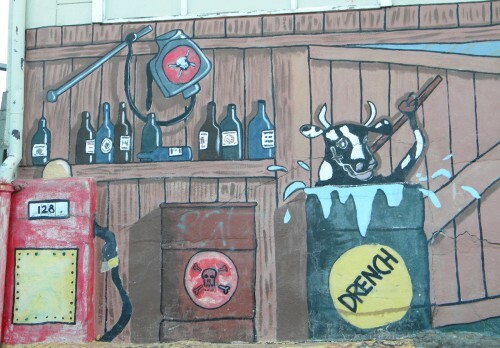 The Marlborough region is renowned for its fine wines. Some of the very best are never exported. 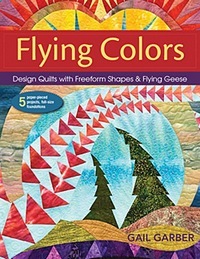 We picked up a winery map at the local quilt shop, the Quilt Barn, and I asked what they recommended of the many that were in the area. 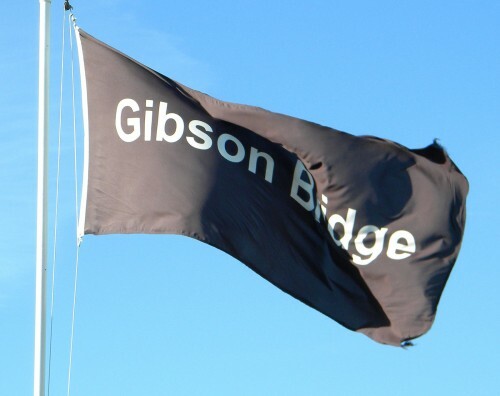 Gibson Bridge, in Renwick, had won numerous awards, including Marlborough’s Best Cellar Door 2010. It was settled and we were off to find them in our rather large bus. The 6 acres of grapes are hand picked and pressed. 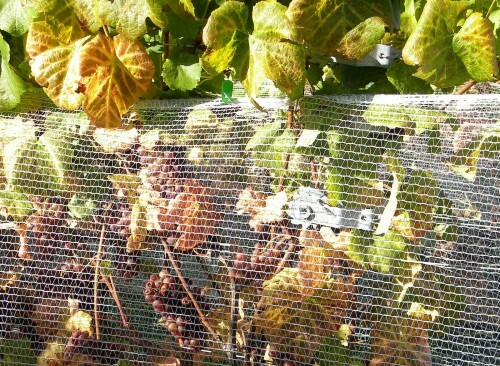 Only the best for the Gibson Bridge grapes. 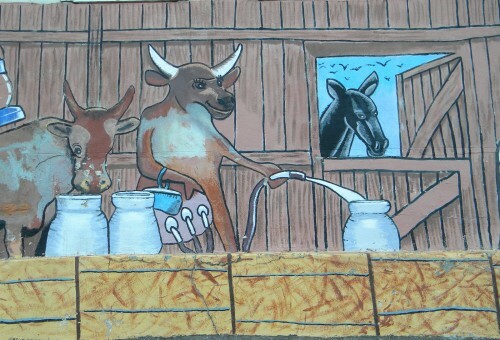 Two bottles went home with me that day, with special packing to pad them in my now seriously overweight suitcase. It’s so worth it for something this special. Another suitcase and an extra bag charge, but two precious bottles now reside in New Mexico waiting for that special occasion to arise. I already know how good it will taste! What a dramatic view from the ferry that would take our group to Picton on South Island. 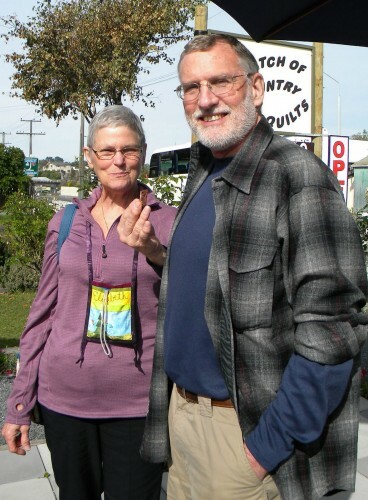 Marci and Ina, from Albuquerque, were busy taking photos. 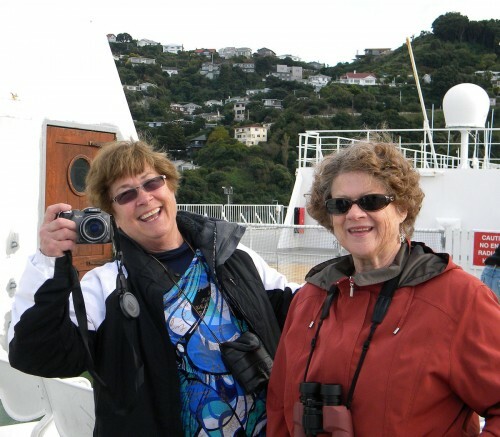 And Shirley and Judy, from Prescott, AZ, just relaxed and watched the scenery. 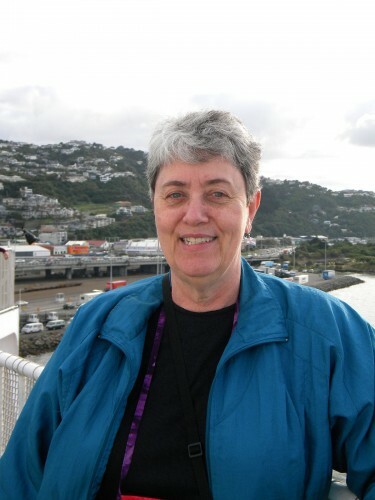 It was on this ferry ride that we saw Blue Penguins as we motored through the Marlborough Sounds. 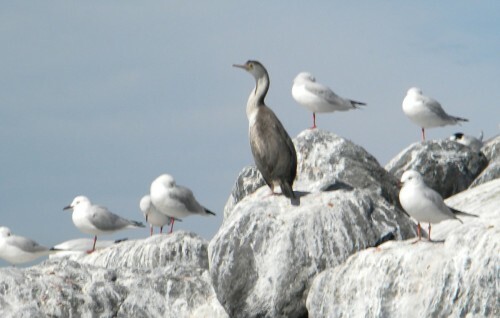 And, a King Shag! 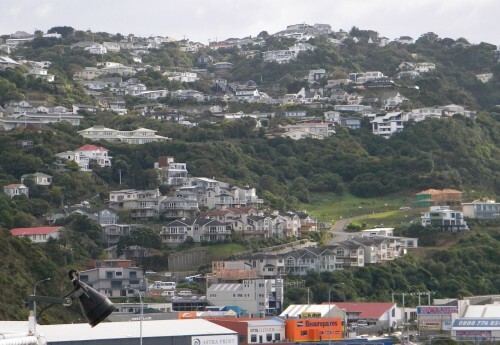 We learned much about the threats faced by New Zealand’s native birds when it comes to introduced predatory mammals, rats, cats, stoats, and possums. 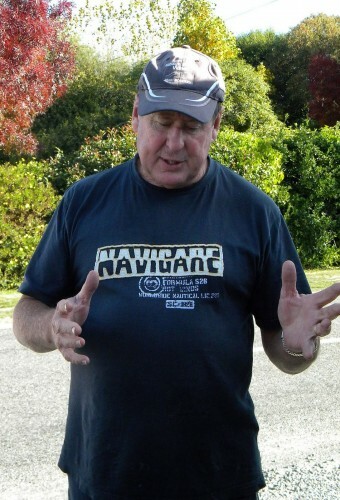 The NZ Department of Conservation spends millions of dollars each year, trying to control their populations. 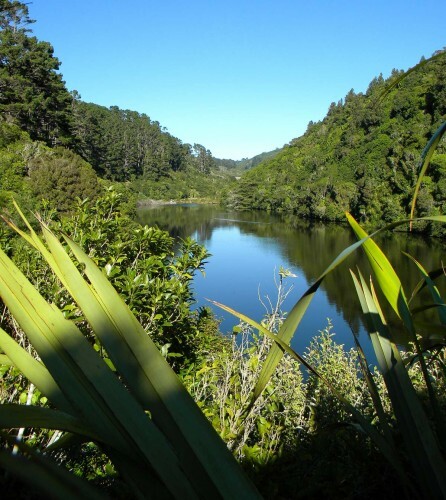 There are several predators free preserves on off-shore islands, but Zealandia is one of the first predator-free, ecological preserves on the mainland. With a predator-proof fence that keeps the mammals out, the birds are free to come and go. The difference is immediately apparent on approach to Zealandia. Riotous bid song fills the air. The cacophony is much like what must have greeted the earliest settlers to the unspoiled island. 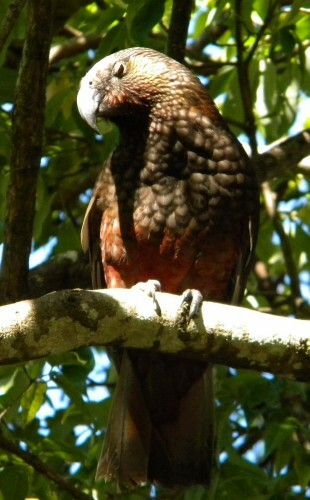 Kaka are plentiful at Zealandia, boisterous and confident. A pair of Takahe had been recently introduced to Zealandia. 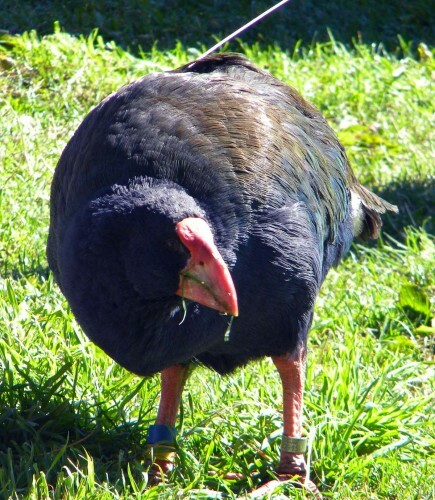 Takahe were thought to be extinct until a small population was discovered in the Murchison Mountains on South Island in New Zealand. Looking up toward the top of the valley. 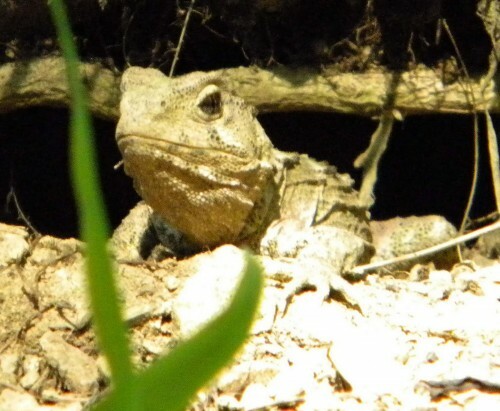 Zealandia also boasts a breeding population of Tuatara, ancient reptiles native to New Zealand. Tuatara can live 100 years or longer. We saw many native species that were impossible to catch with the lens of the camera, Stitchbird, Saddleback, Tomtit, New Zealand Scaup and, of course, the inimitable Tui. A pair of New Zealand Falcons has a nesting territory in the park, but they were not evident during our visit. 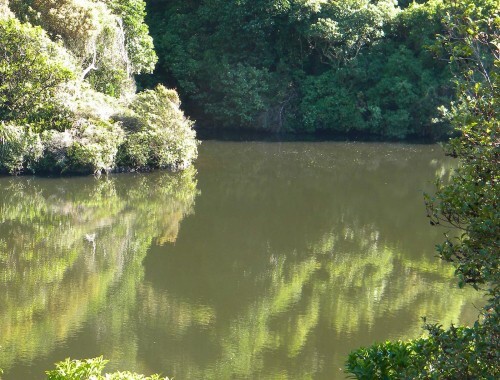 Zealandia – a must see location when you nest visit New Zealand!!! Sheryl Anicich and her quilt, "New York Garden"
The Wellington Quilter’s Guild hosted a pot luck dinner for our group and what a spread they provided. We really enjoyed their hospitality and the “show and tell” they had arranged. 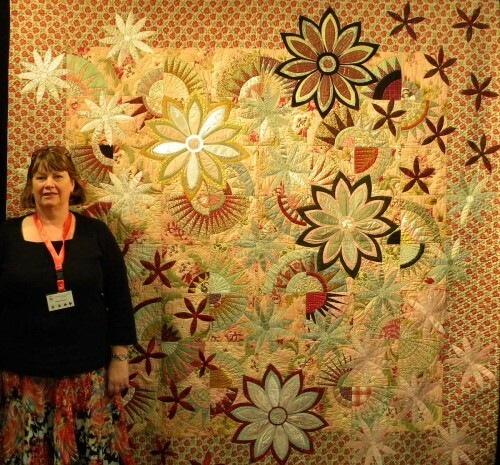 Sadly, I forgot my camera that night so don’t have any pix, but as it turned out we seemed to run in the Wellington girls quite a bit in Queenstown, so I was able to snap this image of Sheryl Anicich and her quilt, “New York Garden”. 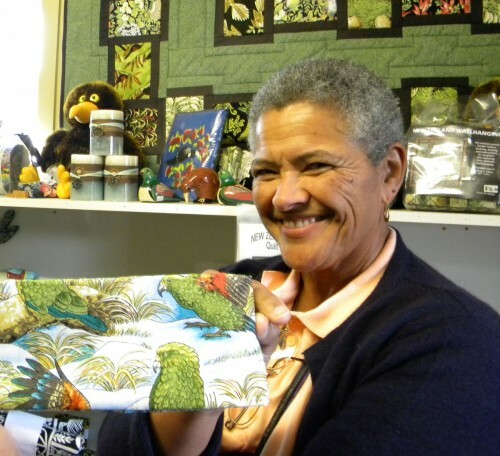 The quilt was part of the traveling exhibit and book, “Made in New Zealand II“.